I stumbled upon Benchmark the first time by accident. My husband and I were embarking on a vegan experiment, so of course we needed to celebrate our last night of being omnivores with a huge steak dinner. GOOD steakhouses are few and far between in NY unless you’re willing to dip into your child’s college fund. I’ve yet to go to Peter Luger and have heard very good things, but Williamsburg was just too far. Plus I knew we’d never get a Saturday night reservation the night before. So I did what I always do when looking for a new restaurant–Googled, Yelped and checked Zagat. Benchmark was top of the list. Not only was it in Park Slope (close!) but prices were reasonable and it was said to rival Peter Luger. So we took a chance. We had no problem getting a last minute reservation. The place was comfortably crowded but no lines or mobs outside the door, as you would usually expect at a Brooklyn restaurant on Saturday night. The steak was delicious and (Bonus!) grass fed and humanely raised. A farm to table steakhouse–what a concept! But I’m not really here to talk about the steaks, I’m here to talk Brunch. More recently we happened to be in the neighborhood of Benchmark on a Sunday afternoon. I was curious to see if this steakhouse was a one trick pony so we decided to stop by for lunch. The place was EMPTY. This amazed me. Even the most uninviting hole in the wall places have at least a 20 minute wait for brunch. It’s just a thing. You live in New York, you live for brunch. We had our choice of a la carte or a two course prix fixe. Not being super hungry, we opted for a single dish each. 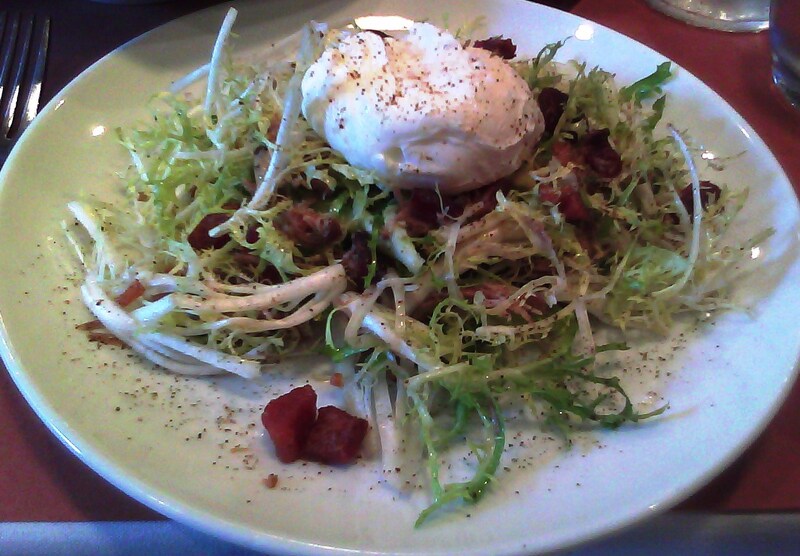 I opted for the Pulled Duck Confit Salad and my husband the Short Rib Benedict (so predictable). Before our entrees arrived we were first greeted by homemade breads and muffins with house made preserves. Then the main event. My duck was moist, the soft poached egg perfect and the greens with just the right amount of vinaigrette. My husband inhaled his Benedict so I’m assuming it was a hit as well. We later learned of a tantilizing Short Rib trio–not on the menu, but can be prepared if requested. We know what we’re getting next time. Not that I mind a quiet afternoon brunch, but this place was just too quiet. It makes me wonder, do people know it exists? The tiny garden around the corner leading into what might be Park Slope’s biggest secret? Or perhaps it was just a fluke weekend and we lucked out. Either way, Benchmark has gained one regular customer.